-Twice the Size, Twice the Terror! Eliot Brodsky's Monsterpalooza convention is a glorious celebration of the art of movie monsters. The three day event has become a required yearly pilgrimage for any true monster movie fan. The show is a gathering that brings together artists, celebrities, cosplayers and vendors galore. It's not hyperbole when I say that this show has gotten bigger and better with each passing year. This year was definitely no exception. The venerable movie convention found a new home, for the first time, in the Pasadena convention center. The result was a show floor that was at least three times larger than any previous Monsterpalooza. The exhibit hall was packed with attractions, artists, vendors, and celebrities. When I first hit the show floor I was overwhelemed by the sheer amount of things to do and see. After throroughly reviewing the show program, which was given free to everyone in attendance, I headed for the main hall. Monsterpalooza is a celebration of movie monsters and the people who love them. At the core of this celebration is a common love for the special effects industry. Some of the biggest names in makeup special effects were on the show floor providing live demonstrations of their latest products. Attendees could also sample these products for themselves and speak directly with company reps. There were even opportunities to meet and greet various luminaries from the makeup special effects community. You could even sign up for special classes or enroll in a full time art school. It was a great way for a budding artist to make connections and find their way into the industry. Meanwhile, if you're just a fan of this unique artform, or a fanboy in my case, you could also get the chance to be transformed into a monster by some of the most talented artists in the industry. What an honor! Simply observing their work over the course of the three day weekend was truly a sight to behold. One of the main reasons I like to attend any convention is to hunt for cool merchandise. 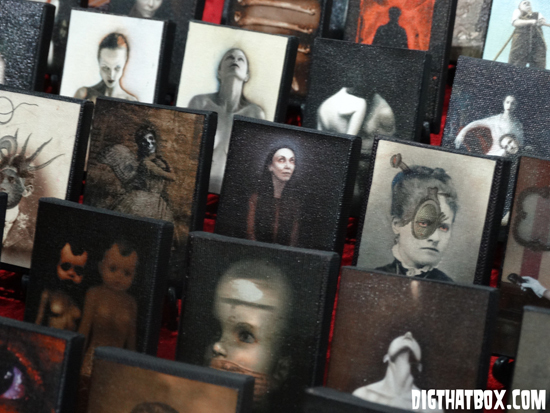 Monsterpalooza was filled with vendors selling every type of product you could imagine. First up, there was the standard stuff like movie posters, DVDs, music and collectibles. If you were looking for a rare film or TV show collection, chances are someone had it in stock. One seller had the best selection of movie soundtracks I have ever seen in person. Another had an assortment of movie posters so large and diverse it could fill an entire gallery. This was definitely a movie buff's dream come true! Whenever I attend a show like this I really enjoy finding unique, one of a kind, hand made items. I'm a frequent shopper on websites like Etsy, so it's always nice to visit a convention and see all the custom made wares in person. Walking the show floor I found everything from jewelry to designer soaps. I was quite impressed by all the original artwork. The sheer amount of artistic talent on display was staggering. I even found one vendor who was selling full size, street legal, custom designed motorcycles. I was completely blown away by the incredible variety of amazing products. My first thought after seeing all this great stuff was that I really needed to hit the ATM to get some more cash. Luckily most of the vendors also accepted major credit cards. I came to the show planning to keep my shopping under control, and instead I left with a ton of great merchandise. The schedule of events for Monsterpalooza 2016 was jam packed with fun things to do and see. This included a number of different special presentations, most which were held in two spacious theaters, while others were scattered throughout the convention center. The big attractions ranged from movie screenings to celebrity guest panels. Representatives from companies like Premiere Products Inc took to the stage to talk about and demonstrate their latest products. We also were treated to a free instructional class in makeup techniques from the folks over at European Body Art. Our friends from 3D Space Los Angeles were tucked away in a small theater just next door to the main stage. All weekend long they were showing 3D movies and clips. At the close of the show they held a special raffle where fans could win a number of different prizes, including books, movies and incredible 3D artwork. All of the proceeds from the raffle went towards preserving the history of 3D movies. It's truly an honorable cause. I'm always happy to see these folks at the show. The most glorious moment of the entire show was a panel called "Breathing Life into Godzilla." Four of the biggest names in the history of the Godzilla franchise gathered together to share their stories with their adoring fans. The illustrious guest list included actors and artists who are the pillars of the kaiju genre. First on the list was Haruo Nakajima, the man known as "Mr. Godzilla." He portrayed Godzilla from the 1950's through the early 1970's in 12 consecutive movies. Legendary creature creator Keizo Murase was also on hand, and was joined by his fellow visonary Shinichi Wakasa, the man who brought us the incredible "millenium" Godzilla design. Rounding out the bunch was Shinji Nishikawa, an exceptionally talented artist known for his work in the franchise. I have to say that witnessing this panel was truly a special moment. Having the opportunity to meet the people behind my favorite monster movie franchise was an incredible honor, and it's a memory that I will always cherish. At the end of the panel the four celebrities stood up and posed for a photo session. They were joined by a devoted fan wearing his own custom made Godzilla costume. After the conclusion of the panel I saw Mr. Haruo Nakajima demonstrating some of his signature moves to the man dressed as Godzilla. He was actually instructing him on how to do Godzilla's famous hand gestures. For me this was one of the best moments of the show. Of course no Monsterpalooza would be complete without the annual costume contest. It was held during the spectacular after-life, after party, hosted by Premiere Products Inc. The event was FREE for anyone wearing a Monsterpalooza wrist band. Master of ceremonies Monte Revolta and his Band of the Living Dead led the celebration as guys and ghouls danced the night away. At the conclusion of the party a winner was chosen in the costume contest. The lucky fan received a generous cash prize along with some other great merchandise. This show has always been known for having an impressive lineup of celebrity guests. However, this year the event organizers truly outdid themselves. The robust guest list rivaled that of any previous show. Just some of the stars in attendence included Adrienne Barbeau, Doug Bradley, Ashley Lawrence, Al Leong, David Naughton, James Remar, Tom Savini, Fred Williamson and Casper Van Dien. The full lineup included over 50 stars from stage, screen and TV. It truly was a dream come true for autograph hunters. Take a video tour of the Monsterpalooza 2016 Museum! Step inside and take a look at all the terrifying exhibits on display. See life size creations from all your favorite horror movies and TV shows. The museum was also the host to several unique creations on display for the very first time. Sights include characters from Michael Jackson's Thriller video, Game of Thrones, The Smurfs, Batman VS Superman, The Terminator, Bruce Lee, the X-Men, Star Wars, and even a rare sighting of Kurt Cobain. This museum also had touching tributes to Forrest J Ackerman and HR Giger. About The Author: Elliott S. Thomas is our resident horror movie maniac, zine publisher and our intrepid man in the field. He is currently on a flight to Tokyo in pursuit of the legendary Godzilla. Be sure to check out our Hollywood YouTube Channel for more videos from the show.